World Athletics Final Is Saturday Sunday!!! 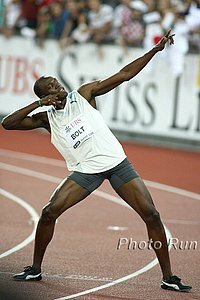 "So when people ask me about (Usain) Bolt, I say he could be the greatest athlete of all time. But for someone to run 10.03 one year and 9.69 the next, if you don't question that in a sport that has the reputation it has right now, you're a fool. Period." - Former sprint and long jump great Carl Lewis commenting for the first time in-depth on Usain Bolt's performance at the Olympics. There are more quotes in the interview that are way more inflammatory if taken out of context. Lewis started the interview with, "I'm still working with the fact that he dropped from 10-flat to 9.6 in one year. I think there are some issues. I'm proud of America right now because we have the best random and most comprehensive drug testing program." But the interview is an unbeliebably good read and a rarity in that it's a legend speaking unfiltered truth. We're sure he'll be ripped for it but it's an unreal read. He covers everything imaginable. IAAF / VTB Bank World Athletics Final Is Saturday & Sunday *Startlists Now Available - Great Straight Finals *Time Schedule (Subtract 6 hrs to get EST). If Weltklasse was the Olympics in a day, then this is the Olympics in two days as everything is a straight final. The meet is loaded and is the final blowout to a fantastic 2008. $130,000 is on the line for world records.Every event really is worthwhile. Things we haven't talked about include a sick men's shot put. *Day 1 Preview: Men's 100 Featuring Asafa Powell , Men's 400: Wariner-Merritt and Women's 5k and Steeplechase Highlight Some Great Action. *Kenya's 800 & 1,500 Olympic Champs Pamela Jelimo and Nancy Lagat Are Ready For World Athletics Final If Jelimo can get the world record, she'll get $130,000. Lagat will have her hands full with Jamal and others including Shannon Rowbury.